-d is the database name you want to export. -u the user and include -p for the password prompt. WordPress stores the path of files in the database. This means that everything will point to localhost. We have to make this point to your new site. Open the SQL file with a standard editor like Notepad++, Nano, Vim – ( It may take a while ). Do a search and replace, searching for your local path (mine is localhost/wordpress ) en replace that with your new site ( mine weblogmechanic.com ). Wait until it’s done and save it. 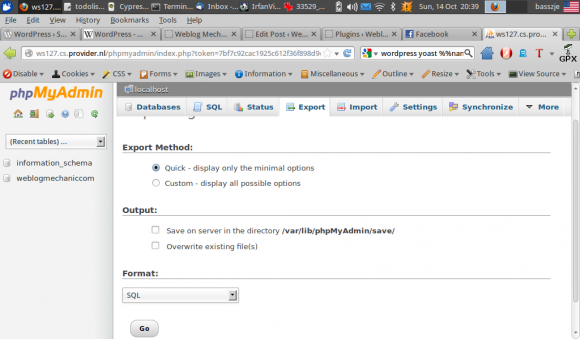 In PHPMyAdmin select a database ( create one if there are none ) and hit ‘import’. Point to your new .sql file and everything will be imported. Copy the installation on your local computer to the server. This should be pretty easy with FTP. Don’t forget to update your wp-config settings like database name, login etc. If everything went well you just moved your site! You can use this instructions as well for moving between one location to another. The steps should be about the same!